Indiana's HIV Outbreak Leads To Reversal On Needle Exchanges : Shots - Health News Scott County's needle exchange program is part of a response to the largest HIV outbreak in Indiana history. After a slow start in April, the needle exchange is drawing users and community support. Nurse Brittany Combs of Scottsburg, Ind., delivers clean needles to a member of the needle exchange program. Users must have a membership ID card to exchange needles. "Anybody need clean needles today?" she shouted out the window at people sitting on front porches or walking down the street. 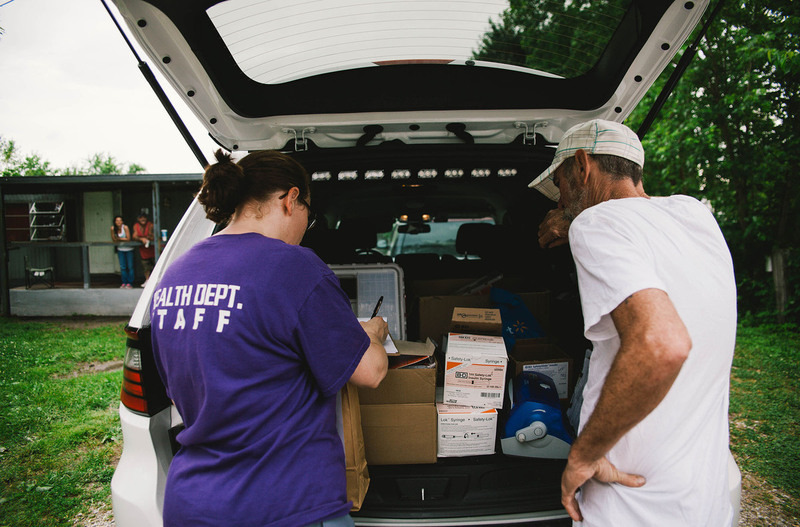 When Combs, a nurse with the Scott County Health Department, got takers, she made sure they had a unique ID card before opening up the hatch and handing each of them a week's worth of syringes. Combs' SUV serves as Scott County's mobile needle exchange unit. The needle exchange program is part of the county's emergency response to the largest HIV outbreak in Indiana's history--more than 160 people have tested positive since December—most of the cases are linked to injection drug use. By giving injection drug users access to clean needles, the county hopes to interrupt the spread of HIV. The needle exchange program, which also includes a storefront location, is the first of its kind in Indiana. It has been running on a temporary basis since early April, and last week the state approved the county's request to extend it for a full year. Needle exchanges were banned in Indiana until April, and individual counties still must seek approval from the state to operate one. The Scott County exchange seems to be gaining momentum. During its first week, only four people came by. Now, more than 170 people have signed up, and each day they trade in hundreds of used syringes for clean ones. Combs is heartened by the response. After she paid a visit to one run-down two-story house, she got back in the driver's seat with a smile. "I got two new people signed up, which is fantastic," she said. "Yesterday, we had people running after us, waving us down." Drug users aren't the only ones who had to warm up to the idea. Many people in Scott County, including Combs, used to be against it. Opponents say handing out clean needles enables drug use. But public health officials point to evidence showing that exchanges reduce the spread of disease. "The gut reaction of all of us at the health department was, 'No way,' " Combs says. She changed her mind when she looked at the research, which shows that needle exchanges curb the spread of infectious diseases such as hepatitis C and HIV. "This HIV outbreak has really opened my eyes to the trouble that a lot of people have gotten themselves in, and how much help they really do need." Some infectious disease specialists have raised concerns over how Scott County's program operates. Needle exchanges typically hand out more needles than one person needs, so a user can pass them on to others. But Scott County's program requires people to register, and they only get enough needles to last a week. Combs says this arrangement helps connect drug users with treatment options by keeping them in regular contact with health workers. That element was important in getting the people throughout the county on board. "We had to make the program adaptable, so everybody would accept it," she says. "A lot of people in our community are really conservative, and they really didn't understand how it worked. But when we explain how the program is set up, then they agree to it." Nurse Brittany Combs exchanges needles three or four times a week in Austin and Scottsburg, Ind. "I've always wanted to do mission work," she says. "I never thought I'd be doing mission work in my own backyard." One of the converts was Austin's police chief, Don Spicer. He became a supporter when he was told the program would link drug users to HIV and addiction treatment. "If I didn't have that knowledge, I'd still be against it," he says. Before the exchange, Spicer would arrest anyone he caught with a syringe. Now, he lets them go, as long as they have a card to prove they're participating in the program. Critics have argued that arresting drug users for mere possession of a syringe undermines trust in the needle exchange program. Local law enforcement says that arresting users who aren't in the program gives drug users an incentive to sign up. Support from the health and police departments has helped foster acceptance in the community. For instance, Oasis of Hope, a religious group in town, has asked that the mobile needle exchange unit show up for its weekly free meals which attract many drug users in the community. Still, there are naysayers. Riding around with Spicer and Brittany Combs, a few people complained about the exchange. One man said he started to resent the program when he found needles in his yard. And Combs says health workers have seen comments on Facebook from people who are against it. But the posters didn't feel strongly enough to voice their concerns at a public hearing to discuss extending the needle exchange. Combs says the benefits of the exchange are clear. "I know of five people that were HIV negative ... that just got retested, and they're all still negative," she says. "So I know we've saved five people from getting HIV. Now, I see that it works." This piece comes from Side Effects Public Media, a public radio reporting collaborative that explores the impacts of place, policy and economics on health. Find more of Side Effects' coverage of HIV in Scott County here. Or follow the organization on social media here.